In 15 years of homeschooling, I've read over 200 chapter books aloud to our kids. It's kind of my thing, you know? If it's not your thing, don't sweat it - find other ways to enjoy great literature together, like popping a recorded book into your car and listening on long car trips. Hot summer afternoons are great for flopping on the couch and listening to something really good. The list below is in no particular order, and you can find many more titles under the category Books to Read-Aloud. All links are affiliate links, but several of these titles are available for free or mere pennies. 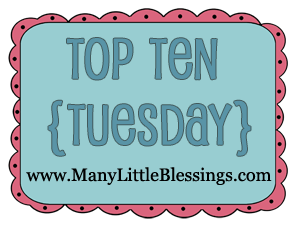 This blog hop is inspired by our dear friend and sister Angie of Many Little Blessings. We would love to have you join us during our ten week adventure. Please link up at Angie’s blog by clicking the image below.